I still can’t believe it, but I am now a deacon! I was ordained last Saturday morning in Charleston by Bishop Baker, along with two of my brother seminarians, after we made our commitment to obedience, prayer, and celibacy. Many people have asked me if I was nervous. 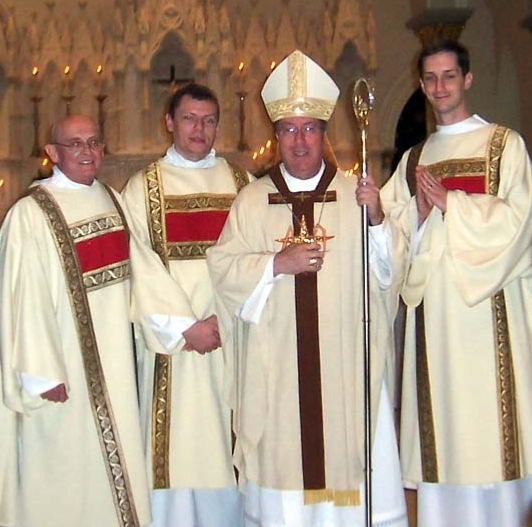 It’s a good question, since becoming a deacon is the “point of no return” in many respects and is usually a lot more nerve-racking for a seminarian than his priestly ordination. But thankfully I was very peaceful as the big day approached. There was no tossing and turning in bed the night before. It was only when we stood at the back of the cathedral, about to walk down the aisle, that I felt butterflies in my stomach like those I imagine a bride feels as she prepares to enter the church for her wedding. One of the biggest challenges, surprisingly, came in the form of a little baby boy. At the beginning of the Mass, the three of us deacon candidates were seated in the congregation with our families. Sitting in front of us was a mother holding a baby boy. He was turned around in his mother’s arms and looking straight at me, smiling up to me with beautiful blue eyes. Looking at him, I couldn’t help tearing up. The hardest part of celibacy for me has always been not being a dad and having my own children, and this adorable little baby suddenly represented all of that in a piercing way. For a brief moment there I was struck with the sudden urge to say “I can’t do this!” and to go running back down the aisle, like Julia Roberts in “Runaway Bride,” my white robe flying behind me as I ran out the cathedral doors and into the Charleston sun to find some beautiful Catholic woman with whom I could have a dozen kids and live happily ever after. Fortunately the moment passed as quickly as it came and I stayed where I was, knowing that God is calling me to be the father of countless spiritual children. Before I knew it, the gospel was proclaimed—the one where Jesus tells us to pray for laborers for the harvest—and the three of us were each called by name and we left our families to answer the call. (A great symbol, as my sister pointed out.) We were presented to the bishop and to the people as candidates for ordination. The people clapped with gratitude. We listened as the bishop gave his homily, and then we were called over to make our different promises. I am happy to report that my voice rang out clear and strong for each “I do!”, including the “biggie” of celibacy. Then came the litany of the saints, when the choir sings out the names of some of the greatest saints in the history of the Church, and everyone responds singing, “Pray for us!” It is a time when we as a church are asking all of those in heaven to pray to God for us, and especially for those who are about to be ordained. During this time the three of us were lying prostrate on the floor, signifying our submission and self-offering. Many people have told me that this was the part of the liturgy that they found most moving, with the beautiful music and the sight of us lying there. I meanwhile remembered the advice that one of the priests had given us just before the Mass began: “During the litany, just pray!” So I didn’t try to follow the litany; I just laid there and thanked God for bringing me so far and for giving me such a beautiful calling. Soon afterward, the bishop silently laid his hands on each of us and prayed over us—the gesture used since apostolic times to ordain a man to ministry—and we were officially deacons! The bishop stood up and congratulated each of us, telling us with a smile, “You made it!” It was a pretty amazing moment. We then were dressed in the vestments worn by deacons. I was helped into the new “duds” by my pastor from Aiken, Fr. James LeBlanc, who had kindly agreed to be the one who vested me. When we turned around all dressed like deacons, everyone clapped wildly and the three of us just stood there trying to take it all in. I’m still trying to get used to being a deacon. It has been strange to wear my clerical clothes around town; no one has yet called me “Father” but I can tell people are scratching their heads over such a young guy dressed like a priest. The highlight so far has been preaching. On Sunday I preached for the first time at my home parish, with the theme “speaking the truth in love.” With God’s grace, I will live out that theme in my ministry as a deacon and as a priest! Thank you for your prayers!